What is it like to travel to Fiji? Having recently returned from Fiji, I’m reminded why a trip to Fiji isn’t just a trip to another tropical paradise. Sure, Fiji is indeed a tropical paradise with white sand beaches, swaying palm trees, clear azure waters and amazing private island resorts. But it’s so much more. While Fiji is only about 7,100 square miles, about the size of New Jersey, the 333 different islands composing Fiji create a vast diversity. There are so many different experiences in Fiji, you’ll be hard pressed to say you truly know Fiji without visiting a few. 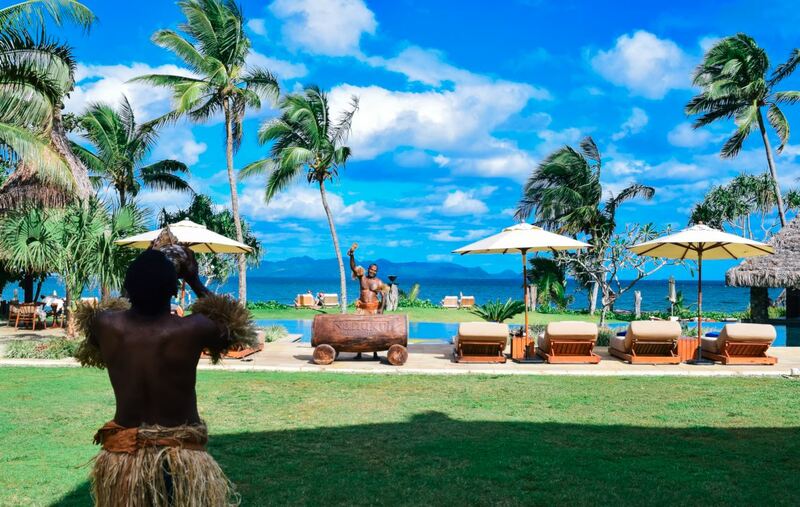 In Fiji you’ll find luxurious, romantic private island resorts, intimate culture-filled experiences, fun family adventures, lush interior jungles, white sand beaches, amazing coral and marine life, friendly accommodating locals and complex and sometimes dark history. There’s so much to explore in Fiji! 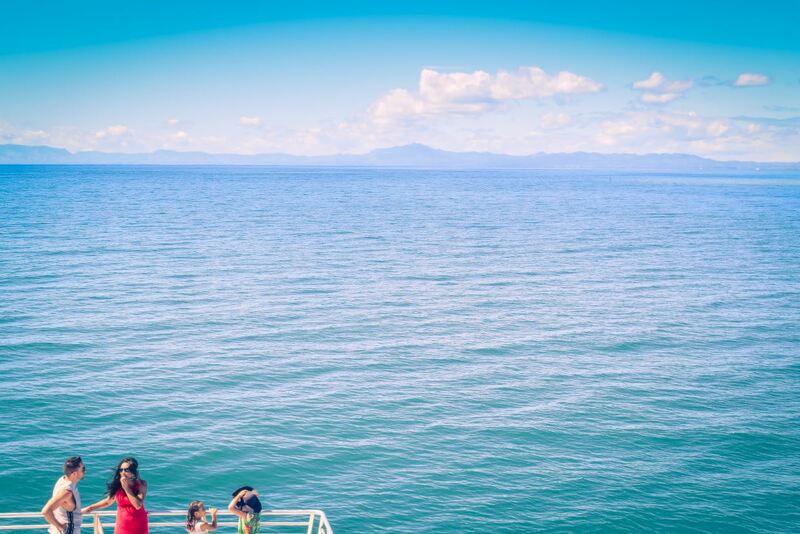 So when people ask, “What is it like to travel to Fiji?” it’s hard to answer concisely. It all really depends on the type of experience you want to have. This blog focuses on the logistics of traveling to Fiji, getting around in Fiji and general tips like climate information and the local customs. You also might want to check out How to Choose a Fiji Destination or Things to Do in Fiji. If you want any more details, please feel free to reach out to one of our Fiji Destination Specialists. They’ll be happy to chat more and answer any of your questions. When you fly to Fiji, you will cross the International Date Line, meaning you will lose 1 day. When you cross on the way back, you will gain a day and arrive home about the same time you left Fiji, if not before. This ‘time travel’ can lead to some pretty heavy jet lag. We always recommend our clients stay busy on their first day in Fiji to reset their internal clocks and get the most out of their vacation. Not giving in to the need to take a nap can really save a vacation. When you get home, the same advice applies. Try hard to get back on your normal schedule without taking naps. Otherwise you may find yourself waking up at 2 in the morning! There are several airlines you can fly on to get to Fiji. One of our favorites is Fiji Airways, where the warm Fijian hospitality is present as soon as you board your aircraft. 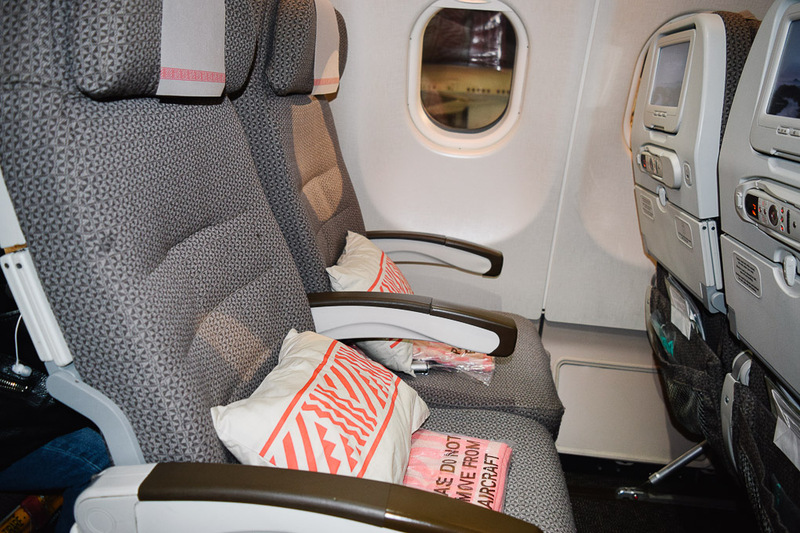 Fiji Airways offers two classes of travel, Economy and Business. This description covers what it is like to travel in the Economy cabin. Inclusive in your ticket will be 1 50lb checked back, 1 personal item and 1 small carry-on item with a 15lb limit. If you’ve never traveled internationally before, you’ll be surprised at how spacious and comfortable the Economy cabin is. Each seat comes with an entertainment center, USB port and an A330-200 Electrical Outlet under the seat. You’ll also get to use a nice blanket and comfy pillow. The seats have little wings you can fold out to catch your head, but I would still recommend a neck pillow. You’ll likely fly overnight to Fiji. When I fly to Fiji, I board the aircraft, watch a movie or read until dinner is over. Meals and limited bar items are inclusive of your flight. The food is good (for airplane food) with Fijian inspired flavors. Since Fiji has a large Indian population, the food options are often curry favored. I only mention this because I know many Americans are not fans of curry. If this is you, you might want to pack some snacks. After dinner, I make my way to the restroom where I try my best to complete my nightly routine. I brush my teeth, wash my face, change into something that resembles pajamas. I bring all this in my carry on, but Fiji Airways does provide little toothbrushes and toothpaste if you forgot yours. Then I go back to my seat and try to get some rest. I find that this routine helps me get the best rest on long-haul flights. When you are about an hour or so from Fiji, the crew will start to serve breakfast. At this time, I’ll head to the restroom again to attempt my morning routine. I wash up, brush my teeth and change clothes. This helps me feel fresh when I arrive in Fiji. I eat breakfast, start watching another movie, and just wait for the flight to be over. You can also use this time to fill out your customs card. They have a little video that explains everything. If you have any open meat snacks or fruit, you should eat it up before you land. 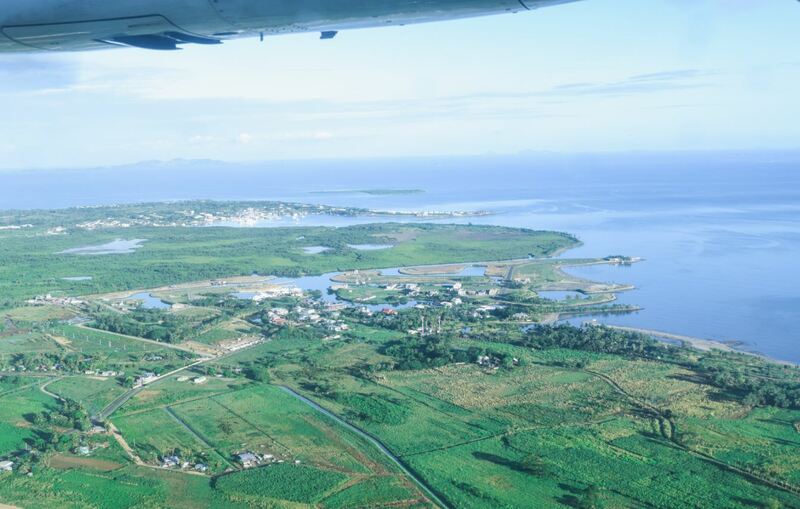 When you land in Nadi, you’ll exit your flight and receive a bunch of “Bula!”s on the way out. You’ll check in with immigration, show your passport a few times and answer a few questions about what you are bringing into the country. Then you’ll pick up your bag and place it in the X-ray machine before you pick it up again and head over to your next destination. If you are staying on the main island of Viti Levu, the Mamanuca Islands or the Yasawa Islands, you’ll head straight to the lobby area and meet with your transfer to your hotel. The islands will require an additional boat transfer, which you may take on that day or you may opt to stay on Viti Levu for 1 night before departing for your island destination. If you are heading to Vanua Levu, Taveuni, or another northern Island, you’ll head to Domestic Departures to catch another short flight. You’ll go out of the International Terminal and turn right and walk over to the Domestic check in. Your best bet is to head there straight away because there are often long lines. After you get checked in, you can get some fresh air before you go into the terminal. Once you reach your final destination, you will make your way to meet your transfer. Most of our clients can find their name on the Arrivals board and make their way to their Airport Welcome by following the directions on the board. Here you will receive a warm Fijian Welcome, further instructions and a welcome gift. If your accommodation is providing the transfer, we will provide detailed instructions to help you find them. The airport is a great place to get a SIM card so you can stay connected while in Fiji. Wi-Fi is not free at many hotels and cellular coverae is pretty good across the popular island, so this might be the best option for you if you want to make Wi-Fi calls, check emails or post to social networks. The SIM cards will work on most unlocked phones. Most of the packages we sell come with a free SIM card and some bonus data when you buy a short-term data package. Just tell your Welcoming hosts that you want to get a SIM card and they will point you in the right direction. When you book a vacation with About Fiji all your transport will be included to get you to where you need to go. In general, you can get about 2 Fijian Dollars for 1 US dollar. It’s easy to withdraw funds with your debit card in the ANZ bank ATMs located in airports, ferry terminals, at many resorts and in town. There are also Westpac ATMs, but these don’t always work on American Debit Cards. The transaction fee is about $9FJD, plus whatever your bank charges. All-inclusive resorts, like you find in the Caribbean, are rare in Fiji. Even the finest all-inclusive resorts will not include alcohol, although some may offer and alcohol inclusive plan for purchase. Most resorts will offer a meal plan to make your trip feel inclusive. Check out some of our inclusive Fiji vacation packages. Fiji is warm throughout the year. It’s a sunny tropical destination, which means you’ll see a lot of sun, but you’ll probably get some rain too. Showers often come in the afternoon and pass quickly. Cooler months are May – November (66 – 84 Degrees Fahrenheit) and warmer, rainier months are from December to April (71 to 92 Degrees Fahrenheit). Fiji is unlike any tropical destination you’ve ever been to. It’s a long flight from the US to Fiji, but well worth it if you want your tropical paradise vacation to be coupled with amazing experiences and a friendly and interesting culture.